In a sudden flurry of activity, I've actually finished a project! 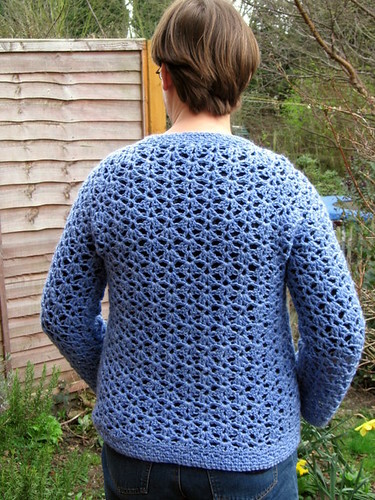 Here we have my version of the Cinnabar Cardigan (Ravelry Link) from Everyday Crochet by Doris Chan. The yarn is James C. Brett Denim with Wool in an Aran weight, which I picked up from a trader at a Machine Knitters Guild event about 18 months ago. I used one ball (400g) and I worked the bulk of the cardigan on a 7mm hook to achive gauge with a 6.5mm hook for the borders. I chose to make the smallest size, so that's to give a finished bust measurement of 35 inches or 88 cm - this is based on my normal sizing so the resulting cardi fits me properly in the shoulders otherwise I would have been drowned in fabric. 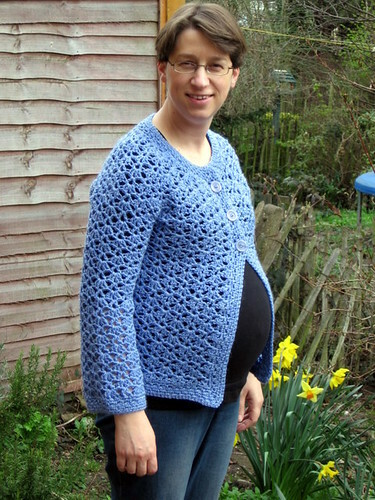 As I wanted this cardigan for both maternity and normal wear, I decided to lengthen the body by adding four rows before starting on the band. The longer line just looks better with the bump, but hopefully not so long it will look silly once I return to something resembling my normal proportions. Rather than relying on a pin or a removable fastening which might not work well with a baby, I added button holes and three buttons which I picked up from Mrs T's (Ravelry Link). 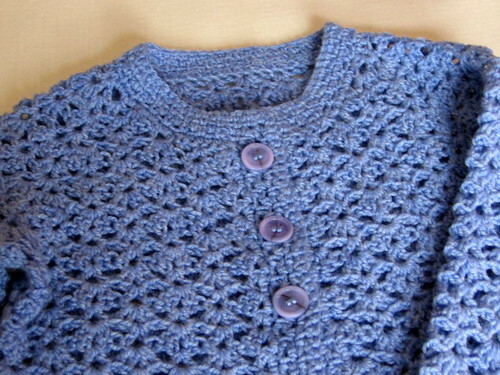 The buttons are actually purple, but take on the blue of the yarn which softens them so they work well with the overall colour of the garment. I also decided to skip the sleeve tapering, giving me looser arms but deliberately shortened them slightly as I hate my cuffs dragging in things. 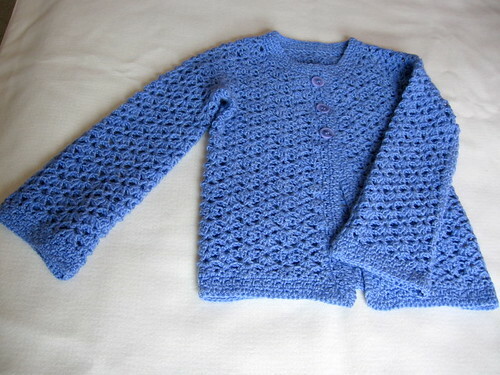 Other than that though, the cardigan is made up as per the pattern and I'm quite pleased with the final result. It fits well across the shoulders and I think the colour works well on me, although not one I'd have normally chosen. Not at all bad for my first ever cardigan. Looks lovely and you're baby bump is very nice and neat too :-) dd1 said, how many babies does she have in there! I said just the one, and then got questioned as to how babies get in there! a whole other story!